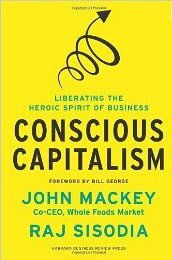 Mackey is the co-founder of Whole Foods Market or, Whole Paycheck as I like to call it. Whole Foods and I are like an old married couple. I love them for what they’ve brought to my life: the availability and variety of a multitude of healthy foods (assuming I make the right choices), and an entire way of life based on natural living. They’ve also overdrawn my bank account on more than one occasion so the resentment, at times, has run high. You could imagine what went through my mind when I saw a kiosk in the middle of the store displaying a stack of these books that likely explained how this offense has come to be perpetrated against me. Nevertheless, I couldn’t imagine my life without Whole Foods. The company’s very existence is an important part of my life. It feels strange to say that but it is true. The book opens with Mackey telling the story of a horrible flood that ruined the very first Whole Foods Market in Austin, TX and how the entire community came together to help him rebuild and re-establish his business. In the process, stakeholders also contributed what they could, forging friendships that 30 years later, still exist in a meaningful way. It was upon this act of kindness that Mackey built his natural empire and it remains one of the core values of his business philosophy. The economic, political and social issues tackled in the book are understated in their ability to teach without taking political sides and question without disrespect. It’s a terrific guide to understanding where we’ve come from and how to create a future where communities are well-served and “profit” is not a dirty word. Very readable, very interesting, and important. Read it and learn.